The mission of our association is the development, support and promotion of creative therapies, particularly of art therapy and drama therapy. The integration of creative therapies into the system of care of people with social or health disabilities. Furthermore: the provision of professional guidance in art therapy, drama therapy, psychotherapy and supervision. The provision of professional training in art therapy and drama therapy. 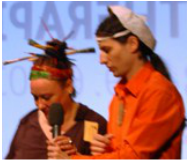 The organisation and the realization of health and social projects – Cirkus Bombastico Praha. The main protagonists of the association are Dipl. KT Beate Albrich and MgA.Viktor Dočkal. We do not provide medical services. In the above mentioned professional organisations both of us adopt and respect the professional standards of given domains as well as their ethical principles. We are opening NEW GROUP in the long term DvT training with art therapy overlap this year! celebrated 20 years on the road!! !